A pregnant woman who was killed in a SWAT raid over the weekend in Indian River County, Fla., was used as a shield by her boyfriend, authorities say. 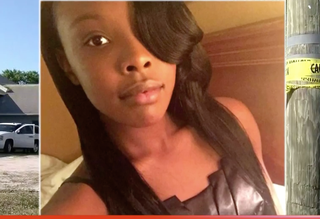 According to CBS12, the family of 21-year-old Alteria Woods are searching for answers after their loved one, an innocent bystander, wound up dead. Woods was reportedly caught up in the crossfire of a shootout and was killed by Indian River County sheriff’s deputies, who were executing a search warrant at what was allegedly a known drug house. Cooper said that her niece was four months pregnant and that the father of the child was 23-year-old Andrew Coffee IV. It was Coffee IV and his father, Andrew Coffee III, who were the targets of deputies during the raid. Indian River County Sheriff Deryl Loar said that the younger Coffee used the young woman as a shield. “Andrew Coffee IV was cowardly, using her as protection,” Loar said. However, the sheriff also expressed sadness for the loss of life, noting that his deputies fired back at the younger Coffee, who was shooting at deputies from a bedroom window. Both father and son appeared in court Monday, and a judge set bond for Coffee III at $93,000, while Coffee IV was being held on $307,000 bond.